What is Machado-Joseph Disease and How is it Caused? ‘Groote Eylandt Syndrome’. The first time I came across this term, I thought it was referring to the relaxed state of the people living here and their innate love for all things outdoors. However, luckily before I adopted this term as a way of describing how much I loved my new lifestyle, I learned that it’s actually the common name for a horrific neurodegenerative disorder called Machado-Joseph Disease (MJD). MJD is one disease you’ve probably never heard of and will never have to worry about personally. That’s because it’s a hereditary disorder mainly carried by Indigenous people living in the Northern parts of Australia. MJD causes progressive deterioration of muscle control and coordination and can affect children as young as 10. The first symptoms of MJD can appear at any stage of life and once those symptoms are present, it can take anywhere between 5-10 years before the sufferer is no longer able bodied and requires full-time care. The initial symptoms of MJD are feeling unbalanced, vision problems and a loss in arm and leg strength. MJD is said to be in the same ‘family’ as Huntington’s disease. Carriers of the MJD gene have a 50/50 chance of passing it on to their children. Sadly, these shocking odds are not the only devastating thing about the transmission of the gene. When it’s passed onto the next generation, the disease is typically expanded, causing the symptoms to appear 8-10 years earlier and of greater severity. Although Australia has the highest known rate of MJD sufferers in the world, there are many theories as to where the disease originated. Initially it was believed that the Portuguese sailors passed the gene onto the Macassans in Indonesia, who in turn, passed it onto the Northern Indigenous tribes whom they traded with throughout the 16th and 17thcentury. Researchers have recently argued the validity of this theory and are trying to determine whether links can be drawn back to Asia. Another theory floating around, more scandalous and less publicised, is that manganese (a black rock embedded deep in the earth) may have had a poisoning effect on those living and growing food crops in the soil directly above it. Groote Eylandt has one of the world’s largest known deposits of manganese. BHP Billiton has been leasing the land from the Indigenous people since 1965 to mine it around the clock and export it on to Asia and a number of other countries. Manganese is considered so valuable due to its ability to strengthen steel used for heavy construction. It is also used in the production of batteries. So, how does manganese allegedly link to MJD? There have been reports of manganese poisoning, termed ‘Manganism’, affecting those working amid the material in the steel industry. Whilst the symptoms of Maganism are likened to that of Parkinson’s disease, one of its effects is damage of the striatum which is a part of the brain that coordinates movement. Is the sharing of this symptom between Manganism and MJD just a coincidence, or could it be that for decades the Indigenous people were unknowingly poisoning themselves? Whilst extensive research has apparently been carried out by BHP, some people are sceptical as to how in-depth the tests went. After all, if it were found out that manganese played a role in the development of such a horrific disease, the whole multi-billion dollar operation would be placed in jeopardy. 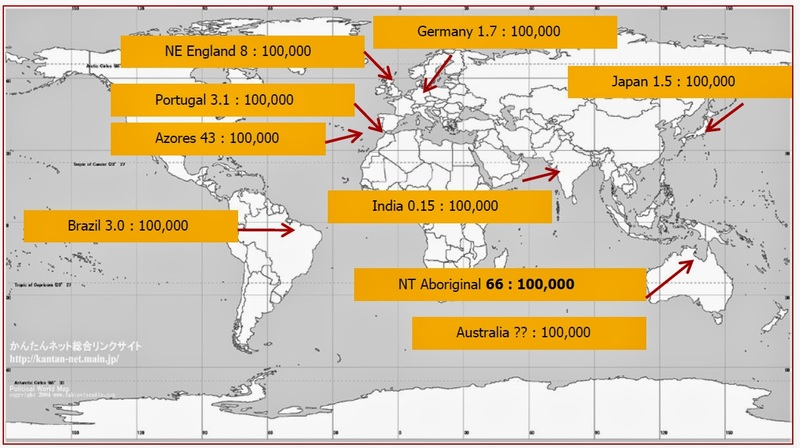 Here is a map showing the approximate number of people affected with MJD worldwhile. The information presented in this post does not represent my personal opinion regarding the underlying cause or origin of MJD. The information is purely presented to help educate others of its existence within the Groote Eylandt community.